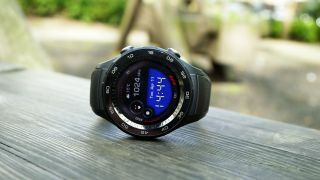 One of the biggest problems with smartwatches is their small screens which can be clunky to interact with, but Huawei might have a solution to that problem. In a patent filed with WIPO (World Intellectual Property Organization) and spotted by LetsGoDigital, the company details a system whereby sensors can scan the area around a smartwatch, recognizing gestures made on the back of your hand. This would allow you to make the shapes of letters on your hand and have them then appear on the smartwatch screen, essentially letting you write by hand on a much larger canvas than the screen itself. But that’s not all, as the sensors could also potentially recognize other gestures such as double taps and long presses. In theory with such a system it may be possible to navigate a smartwatch interface without ever touching the device itself. It sounds like a promising idea – though would require the hand to be kept level with the arm in order for the sensors to recognize inputs. Of course, as with any patent it’s possible that nothing will come of it, and even if this feature does make it to a future smartwatch is might not be ready in time for the Huawei Watch 3, but it would certainly help the wearable stand out.